Author(s) Crawford, Bridget J.; Infanti, Anthony C.
Could a feminist perspective change the shape of tax laws? Feminist reasoning and analysis are recognized as having tremendous potential to affect employment discrimination, sexual harassment, and reproductive rights laws - but they can likewise transform tax law (as well as other statutory or code-based areas of the law). By highlighting the importance of perspective, background, and preconceptions on reading and interpreting statutes, this volume shows what a difference feminist analysis can make to statutory interpretation. Feminist Judgments: Rewritten Tax Opinions brings together a group of scholars and lawyers to rewrite tax decisions in which a feminist emphasis would have changed the outcome, the court's reasoning, or the future direction of the law. 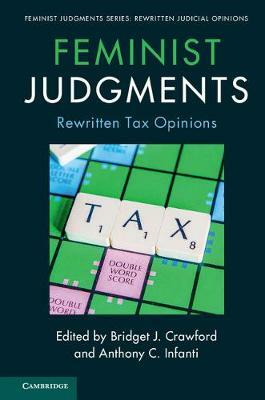 Featuring cases including medical expense deductions for fertility treatment, gender confirmation surgery, tax benefits for married individuals, the tax treatment of tribal lands, and business expense deductions, this volume opens the way for a discussion of how viewpoint is a key factor in statutory interpretation.